Coral Pavilion is chic and elegant, the perfect vacation rental if you want to feel like royalty. You’ll love staring at the ocean right outside the French doors, and the gorgeous archways along the terrace frame the view perfectly. Your guests can spend long hours chatting in the open, spacious living area, and you can retreat to the luxurious Master Suite to unwind at the end of the day. There’s no better way to relax than in the Master Suite’s soaking tub, staring at the sea right outside the window. The three lower level king suites are equally glamorous, so you can easily rent the villa with other couples, and the twin suite is ideal for children because it doesn’t have exterior access. Stunning villa on Grace Bay Beach! Coral Pavilion is an elegant, two-story vacation rental with 120 feet of beach frontage on Grace Bay. This beachfront villa is fully air-conditioned, fully staffed, and fully equipped for a blissful vacation. 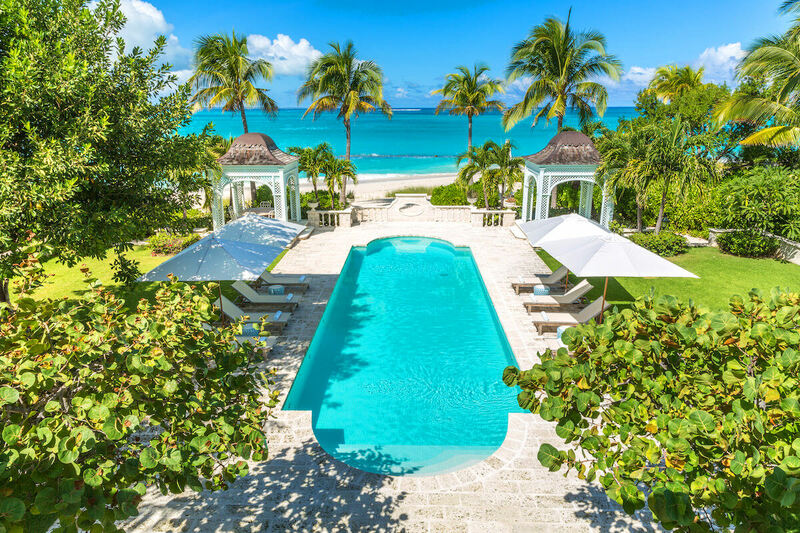 On Grace Bay, complimentary loungers and umbrellas sit on the sand and face the sea. Palm trees dot the cove, adding shade and a tropical ambience. The turquoise sea is a few yards away, and there’s also a Grecian-style heated pool in the middle of the terrace. Loungers and gazebos sit on both sides of the pool, and a lush lawn and garden border the terrace. Enjoy meals al fresco in the dining pavilion after grilling on the BBQ or let the chef prepare a gourmet feast to enjoy at sunset. Take the villa’s bicycles for a ride to explore Grace Bay and get a workout in. Chic, breezy decor inside the open-concept living space is enhanced by nonstop views of the sea and gardens. The entire villa has Sonos, and WiFi coverage extends throughout the property and down to the beach. Cheery blue cabinetry and white subway tile brightens the kitchen, where the chef handles all the cooking on stainless steel appliances. Each of Coral Pavilion’s glamorous bedrooms has an ensuite bathroom, Apple TV and Netflix, and views. The upper level Master Suite can only be accessed by a private staircase, and takes up the entire upper level. Prepared to be spoiled in this suite with a large study, walk-in dressing room, and a personal lounge. Its expansive terrace has a dining table and chaise lounge that overlooks the ocean and pool. The Master Bathroom has a pedestal tub and an open walk-in shower with ocean views. The other three king suites are on the ground level, and each has exterior access to the pool deck or gardens. One king suite has access to the library, which opens to the pool deck. The other two king suites each have French doors that open to the gardens. The fifth suite can be made up as a king or twin suite, and does not have exterior access. There’s also an on-site staff cottage, so the butler, chef, and housekeeper can be readily available. Coral Pavilion is well-protected with an alarm system and on-site security. Coral Pavilion has an ideal location on Turks and Caicos, just 5 minutes from Grace Bay’s restaurants, amenities, and shopping. Princess Alexandra National Park is nearby, and Provo Golf Club is just down the road from the villa. Guests at Coral Pavilion also have access to Seven Stars Resort’s luxurious gym, spa, restaurants, and boutiques. Bedroom 1: Upper Level - Only accessed by a private staircase. Upon arrival guests will be met at the airport by a member of the villa management team and transferred to the villa. Car rental, grocery and beverage shopping (pre-arrival and during your stay), liquor and wine delivery, nanny service, baby equipment, spa services, yoga and personal training, and photography can be arranged for an additional fee.